April is the month to spring into action and get your property in shape for the long-awaited warm weather (yay!). Summer means lots of different things to different people, but whether you are preparing for a season of leisurely outdoor entertaining, gardening, or revving up your home's curb appeal in order to sell, you'll want to make sure your yard and outbuildings are in good shape. 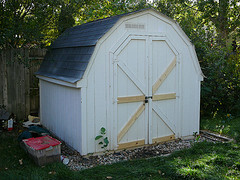 After a long hard winter, sheds, gazebos, and barns often need repair. Why Repair, Rather than Replace, an Old Outbuilding? Sometimes repairing a structure may seem like too much of a hassle. It can be tempting to just replace it with a plastic shed from your local big box store. However, if it was solidly built in the first place, effective repair of your old barn, gazebo, or shed will give you years more useful service and tend to cost you less in the long run. In addition,public awareness of the need to conserve the earth's limited resources is growing. And if you own a property that is historic -- or just quaintly elderly -- the vintage outbuildings can be part of its charm. Regular inspection of outbuildings twice a year, in spring and fall, is recommended. Look at the roof, walls, and flooring; check for moisture, mold or mildew, rotting wood, rust, and dents. At the same time, take this opportunity to clear out the past six months' accumulation of junk as well -- this will make it easier to perform any necessary repairs in a relatively cramped space. Frequently, after a long hard winter, you will find problems stemming from moisture in wooden buildings. A leaky roof or poorly built walls may have allowed rain or snow inside, leading to moldy or rotten wood. Find out what caused the water damage and take care of that first. Decide how much you're ready to invest in the project and whether you are able to tackle it yourself. For example, you can perform minor DIY repairs such as cutting out a small water damaged area and patching it with sound wood. (Be sure to caulk the join well to keep out dampness in the future.) To fix more serious damage, call in a carpentry professional. You won't have to worry about a metal structure rotting or molding, but it can get pretty rusted, banged up, and dented over the years. Removing the rust ASAP is essential; otherwise it will only get worse and weaken the building further. Pound out dents with a rubber mallet, working from the interior. Clean the structure well and sand off all rust, using a power sander as necessary. Patch holes with auto body filler. Once it is thoroughly dry, you will be ready to prime with a rust-inhibiting primer (two coats may be necessary). Dry again, followed by one or two applications of water-based enamel acrylic paint. Alternatively, you may wish to go for a major improvement in your building's appearance by covering it with wooden boards. This is ideal if you are planning to put your property on the market this year. Practical, inexpensive vinyl siding may also be used but wood siding is more attractive and upscale. Decorate your finished product with a trellis for roses or a few hanging planters.